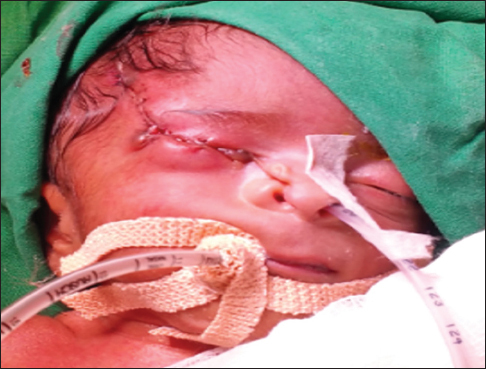 The incidence of the craniofacial cleft is rare ranging between 1.43 and 4.85/100,000 births. Tessier number nine cleft being the rarest, there are a few reports of detailed ophthalmologic examinations performed in them. In this study, 1-day-old female neonate delivered by normal vaginal delivery at term, weighing 1480 g presented with right eye dystopia, cleft extending through the lateral third of the upper eyelid, brow ending at the temporal region, conjunctival congestion, clear cornea 10 mm in diameter, normal anterior chamber, pupil 2 mm reactive to light, clear lens, and normal fundus. Cleft extended downward from the right medial canthus involving the nasal ala and left forearm had an oblique-crease with camptodactyly. 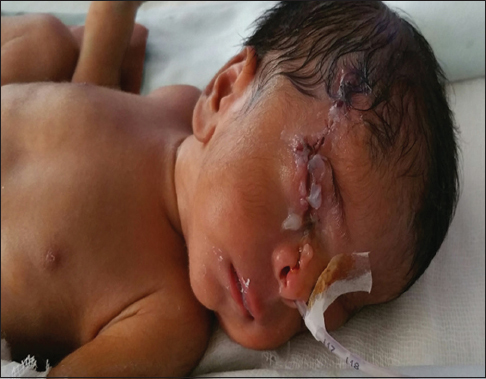 We thus report a case of anterior segment abnormality with an oblique craniofacial cleft. The cause of which is unclear, amniotic band syndrome being a possible cause. Craniofacial clefts are disfiguring facial anomalies. Incidence is rare, ranging between 1.43 and 4.85/100,000 births. In 1976, Tessier proposed an anatomic classification of the craniofacial clefts using the orbit as the primary structure of reference. The number nine cleft is the rarest, described as lateral orbital cleft with soft tissue deformity involving the lateral third of the upper eyelid and underlying bony disruption extending into the temporal fossa., To date, there have been a few reports of detailed ophthalmologic examination in cases of the craniofacial cleft. Here, we report a case of anterior segment abnormality with Tessier nine cleft, nasoschisis, and a left forearm crease. A 20-year-old primi with regular prenatal care, no adverse obstetric or genetic history, normal prenatal laboratory test results and normal antenatal scans presented at term with premature rupture of membranes (PROM) in labor. A live 1480 g baby girl at 38 weeks, was delivered. The Apgar scores were 7 and 8 at one and 5 min, respectively. 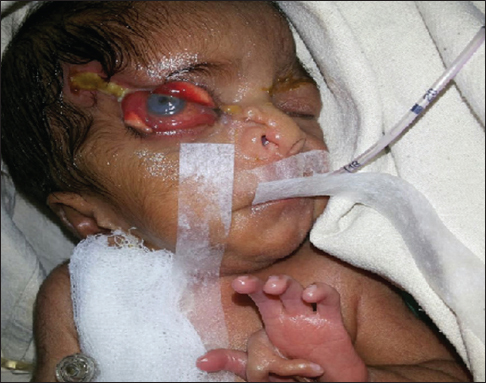 On subsequent examination, the neonates left eye and adnexa were normal. The right eye showed a cleft extending from the lateral third of the upper eyelid, eyebrow to involve the temporal fossa, with the absence of middle third of the upper eyelid with ectropion of the medial two-third and lateral third. Lateral third of the right eyebrow was absent with severe lower eyelid retraction with lateral canthal displacement exposing the right globe [Figure 1]. A deficiency of the superior and lateral orbital rims was felt resulting in a lateral displacement of the globe. There was severe injection and chemosis of the bulbar conjunctiva, cornea measured 10 mm in horizontal diameter, clear. The anterior chamber was well formed, iris normal in color and pattern, pupil 2 mm round, regular and reacting to both direct and indirect light and lens appeared clear. The fundoscopic examination found normal optic nerves and maculae. A deep furrow was noted downward from the medial canthus medial to the lower punctum not involving the horizontal canaliculus, not involving the floor of the orbit. The lacrimal passage being patent with dysplasia of the right nasal ala. No cleft palate or lip was noted. The left forearm showed splitting of the superficial skin with crease extending from medial aspect of the elbow to base of left-hand index finger it thus being flexed with evidence of camptodactyly [Figure 2]. Due to the extreme risk of exposure keratopathy, a moisture chamber was placed over the right eye, and ciprofloxacin eye ointment, preservative free moxifloxacin eye drops were applied four times daily. 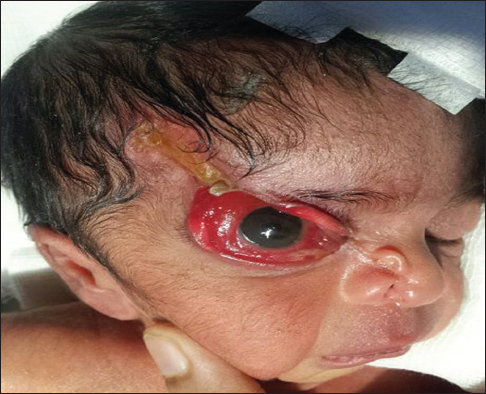 At 72 h after birth, the patient developed right eye exposure keratopathy despite topical therapy [Figure 2]. X-ray skull anteroposterior and lateral view showed evidence of bony defect of the superior orbital rim with distortion of the greater wing of the sphenoid and squamous portion of the temporal bone [Figure 3]. Subsequently, under general anesthesia the child underwent complete temporary tarsorrhaphy [Figure 4] and [Figure 5] to prevent further corneal thinning, perforation, and left forearm contracture release. Thus addressing the cause of primary concern. The type and extent of ophthalmic defects depend on the band location and timing. Defects may include a combination of bony orbital clefts or hypertelorism; lid abnormalities such as colobomas, ptosis, and ectropion; lacrimal outflow obstruction; and exposure keratopathy. Other congenital anomalies associated with it include clubfoot, facial cleft, cleft lip and palate, and supernumerary teeth. 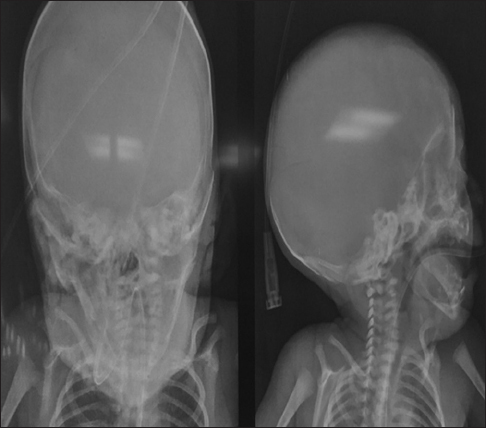 Given the variety of craniofacial lesions encountered, the surgical approach needs to be tailored to the craniofacial defect. Oculoplastic surgery to address functional needs is of primary concern. Later, cosmetic issues can be addressed. In the case described, the neonate presented at birth with a craniofacial cleft number nine with soft tissue and underlying bony involvement, nasoschisis suggestive of an atypical cleft number two with no evidence of cleft number five  and a left forearm crease which could be a result of amniotic band sequence. Even with the high risk of amblyopia the child underwent a complete temporary tarsorrhaphy to prevent further corneal thinning and perforation. The child was then advised to undergo regular follow-ups at 4 weeks followed by at 3 monthly intervals. Release of the tarsorrhaphy sutures of a few millimeters distance centrally would be done to assess the status of the cornea, perform a retinoscopy to determine the presence of an underlying refractive error in view of the risk for amblyopia and to determine the timing for release of the tarsorrhaphy with further reconstruction of the upper eyelid and lateral canthal tendon. The present study thus describes the ophthalmic management of Tessier number nine cleft and thus, may be helpful in counseling and estimating the impact of this syndrome on the eye when in utero. Kawamoto HK Jr. The kaleidoscopic world of rare craniofacial clefts: Order out of chaos (Tessier classification). Clin Plast Surg 1976;3:529-72. Tessier P. Anatomical classification facial, cranio-facial and latero-facial clefts. J Maxillofac Surg 1976;4:69-92. Darzi MA, Chowdri NA. Oblique facial clefts: A report of Tessier numbers 3, 4, 5, and 9 clefts. Cleft Palate Craniofac J 1993;30:414-5. David DJ, Moore MH, Cooter RD, Chow SK. The Tessier number 9 cleft. Plast Reconstr Surg 1989;83:520-7.
van der Meulen JC. Oblique facial clefts caused by amniotic bands. Plast Reconstr Surg 1982;70:269-70. Eppley BL, David L, Li M, Moore CA, Sadove AM. Amniotic band facies. J Craniofac Surg 1998;9:360-5. Miller MT, Deutsch TA, Cronin C, Keys CL. Amniotic bands as a cause of ocular anomalies. Am J Ophthalmol 1987;104:270-9. Seeds JW, Cefalo RC, Herbert WN. Amniotic band syndrome. Am J Obstet Gynecol 1982;144:243-8. Miyajima K, Natsume N, Kawai T, Iizuka T. Oblique facial cleft, cleft palate, and supernumerary teeth secondary to amniotic bands. Cleft Palate Craniofac J 1994;31:483-6. Seah LL, Choo CT, Fong KS. Congenital upper lid colobomas: Management and visual outcome. Ophthal Plast Reconstr Surg 2002;18:190-5. Pereira FJ, Milbratz GH, Cruz AA, Vasconcelos JJ. Ophthalmic considerations in the management of Tessier cleft 5/9. Ophthal Plast Reconstr Surg 2010;26:450-3.